We all have natural rights. I believe one of them is the right to dream, at night, on the hilltops. Most of our rights are written down in law. The right to breathe clean air. To pick and eat fruit from the wild tree or bush. To fish in the sea. To drink water from the stream. Others aren’t written down. Like the right to sleep in the hills. Wild camping in any unenclosed place – far away from roads, buildings and towns – is one of the most precious things a person can experience. Walking, cycling or canoeing into the outdoors, bedding down at dusk and waking with the dawn, contains a magic ingredient that rebalances our body clocks, re-sync our minds, and makes us feel alive. I know. All sounds like pseudo science from a snake oil salesman doesn’t it? But the only catch here is a historic one. A 1,000-year land grab so cleverly PR-managed that it has allowed us to lose touch with who we are. Because alfresco sleep helps reconnect us with an ancient tradition of free movement that we enjoyed for tens of thousands of years before it was forcibly removed from us. That change was like being handed a lifetime ban on walking the pavements for no other reason than someone said, ‘Stop!’ So we got angry at first, but then we forgot. And now no one notices anymore. Partly because our footpaths are disappearing at the very same time public lands are being sold off. But mostly because we have one of the most unequal landownership systems in the world. Old traditions of camping in forests and on moors have almost vanished. And that’s crazy, because no one should have to be told how much fun it is to snooze under the stars while listening to the dry rattle of a grasshopper or the hoot of a tawny owl. We all knew that from our childhoods. Only we’ve been encouraged to forget. During the mid 1980s – between the age of 19 and 27 – I hitchhiked from London to Zurich, to Athens and Israel, to Egypt, and then back into Istanbul, to the Londra Mocamp – the largest lorry park in Europe – out into eastern Turkey and on across Iran, Pakistan, India and Nepal. Down into south-east Asia, Timor and across Australia from the Northern Territories to Perth via Townville, Brisbane, Melbourne, New Zealand, Los Angeles, Fiji, everything in between; and back home. Then I did it all over again. Ditches, gardens, car parks, cemeteries, doorways and bus stops provided a bed. It was a means to an end. A way to keep going. Longer, further. It never felt like hardship, and it never felt wrong. I mostly worked or looked for jobs. In Israel, in Tel Aviv and Eilat, by day and night, in the restaurants and nightclubs, milking cows in Lahore, selling carpets in Cairo, tomato picking in Bowen, Australia. After work, I’d join fellow campers, asleep on the beaches. Strangers for a few minutes, sometimes friends for a lifetime. You learned to make acquaintances quickly. We’d get our stuff stolen occasionally. But more gear went missing when we lived in workers’ accommodation than was ever lost bivvying down in a doorway or park. Fellow workers or the bosses on the farms, hotels and shops would ask what it was all about. The living under wet skies. I’d tell them about the cold, the fear, the rats and the police. Then how people would come to leave us food in the mornings. The workers and bosses said, ‘You’re mad,’ but they didn’t say it with any conviction. It was as if they knew what we knew. That sleeping outdoors was the ultimate escape. That’s something very different and very sad. Homelessness is about having no choices. As young, penniless backpackers we were always making choices. There were times when paying for a night’s accommodation was simply wonderful – even if it did involve selling a good watch or a pair of walking boots. Often, renting a room came after having a bad feeling about a place. Perhaps I’d arrived late, well after dark, and safe didn’t seem realistic. It was just a feeling, and maybe it meant nothing. Just peace of mind. A sense of well-being based on choice, not confinement. If you believe a person does not have a right to sleep unless he has paid for a room, this book is not for you. If you believe that only a person who owns a mountain has a right to sleep there, this book is not for you. Those who think that way are not selfish. They’re frightened. Worried that we sleepers might want to hurt or steal from them. They are wrong. Sleepers are static ships of the night. They are just regular people: climbers, cyclers, travellers and walkers. They pitch up after dark when everyone else has gone home. Not just hidden from view, but hidden from the public consciousness. Invisible aliens crossing over the landscape by day, hanging from hammocks in trees, or bivvying down under bushes by night. We are free to join them; only held back by the false claims that we’re committing a crime or doing something that’s very bad. Fenced in by the fear and ignorance we grew into when we left childhood and adolescence. 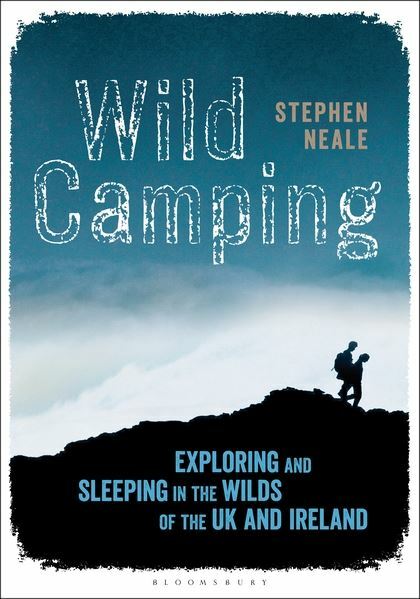 Why – because wild camping is too much fun to be wrong. Oh yeah, I forgot; there’s a ‘how’. That’s the thing with formulas. Remembering them. How – Abandon your car, abandon your fear; abandon everything you have learned to believe in since leaving childhood. On a warm, clear night, go and walk under the stars and in an unenclosed space, far from any road or building, lay down and sleep. It will change your life for ever.